I first learned about the raw jam at a Prevention magazine. 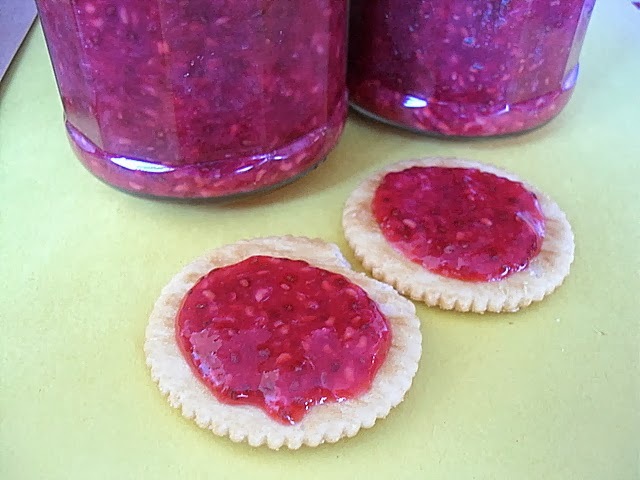 It was the Quick Strawberry Jam that uses the chia seeds that intriguing me. So, of course I had to cut out the recipe and glue it on my cookbook because it will be on my to-make-list. Then, I started seeing other raw jam recipe on my Facebook page, like raw blueberry jam. I finally got to try it with raspberry because it was sour and I bought too much. I wanted to buy 4 but my elder being greedy wanted 6, so I bought 6 packages and it turned out sour and no one wants to eat it!! Ugh!! 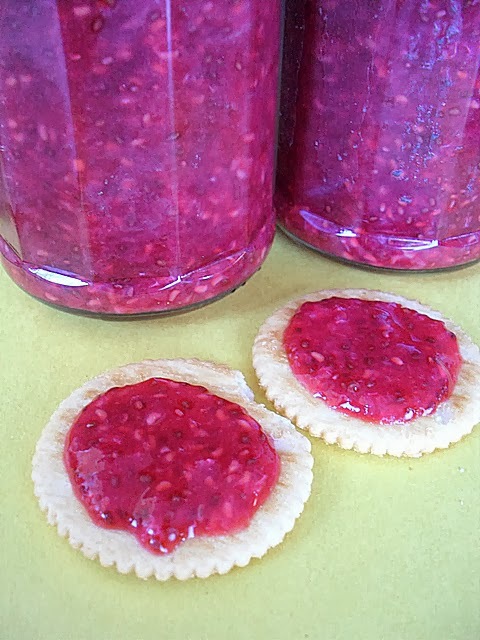 So, I got to make raspberry vinegar and this raspberry chia seeds jam with it. This recipe yields about 4 jam bottles. So, I kept 3 bottles in the freezer, just take each out to thaw in the refrigerator overnight before using. One I keep refrigerated and ready to use and I read that it should last 2-3 weeks. This works as a fruit spread too and can be used in anything. Hmmm....maybe I should use it to make some cupcakes! 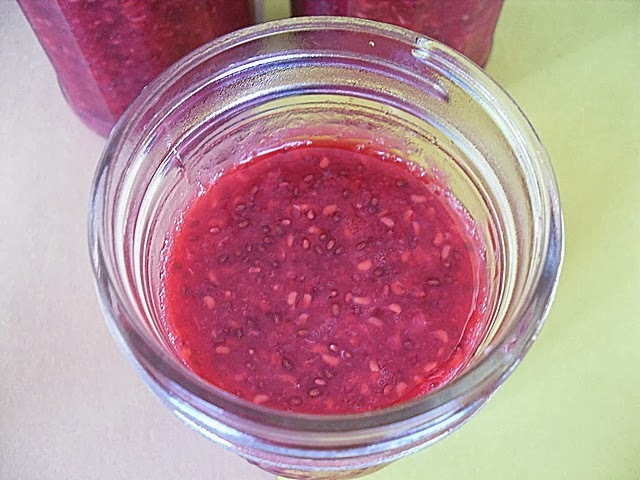 This is definitely a quick way to make jam and healthier, with a dose of omega-3 from the chia seeds, but I still prefer the traditional method. 4 (6oz) packages of raspberries, wash and rinse with water. Put all in a food processor and process until well blended. Store in a glass bottle and keep refrigerated. You can put extra bottles in the freezer and transfer it to the fridge the night before using. Even though I add 4 Tbsp. of honey, this jam is still a bit tart for me, I guess we really have sweet tooth and thus prefer the sweeter traditional method. If you have sweet strawberry and blueberry, this would be good. Raw jam? Interesting! I've never heard of uncooked jam, but I loved the idea of it. Save time and effort standing in front of the stove stirring non-stop. This jam is very healthy indeed with the addition of chia seeds. Thanks for sharing! But this sounds easier than the traditional method ! :P I don't have tart berries of any sort right now to try this though. You are welcome Veronica and Ivy. Tigerfish, actually I would recommend sweet berries like blueberry, blackberry and strawberry, then you won't have to add more honey. Then it should be yummier. You can definitely do this, all you need is chia seeds and a spoon to mush the berries (if you don't have a blender or food processor). Great idea Ching...using Chia seed to thicken the raspberry jam...so refreshing!